I would consider this as my first time making the Glutinous Rice Balls for the winter solstice (冬至), in particular the Naturally Coloured Glutinous Rice Balls 七彩汤圆. 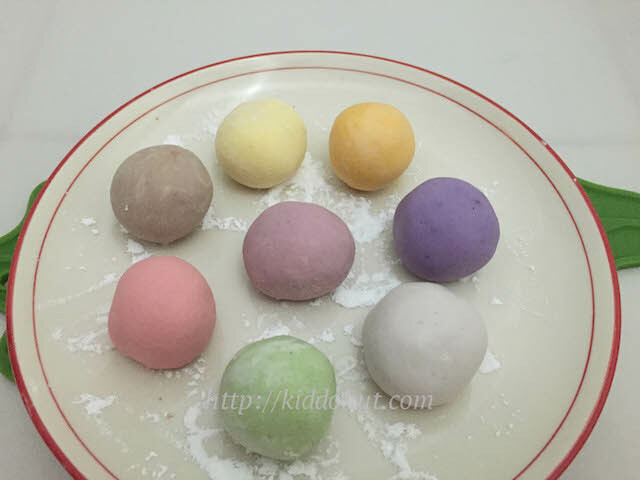 When I was young, every year in a particular early morning during the December, my mum would use the edible red powder, the glutinous rice flour and some water to roll into small balls of white and pink, cook the dough balls and add them into some sugary water as dessert for us as well as for praying. As kids, we would like to lend a “helping hand” but always got rejected for all good reasons I finally could understand now when I have a pair of twins tots who love to self-feed and mess up the house. So this year, I decided to make some glutinous rice balls myself and manage to receive my first order from my mum. From Kiddo Hut’s logo, it is not difficult to guess that I like colourful stuff. I do have some Wilton Food Colourings and a much easier life by using that on my glutinous rice balls, but that will be too easy and nothing to blog. Hence, as a healthier choice and a challenge to myself, I sought to use all natural colours for this dessert. In addition, to make the glutinous rice balls more interesting to eat, I decided to explore new fillings. We always have peanut, red bean and black sesame fillings for the rice balls. How about sweet ginger crunch, chocolate and salty green bean paste as fillings? Personally, I love red bean and black sesame paste fillings so these two got to stay in my recipe! In fact, I have tried using different ingredients to make the various colours and realised the following fruits and vegetables made the best colours. 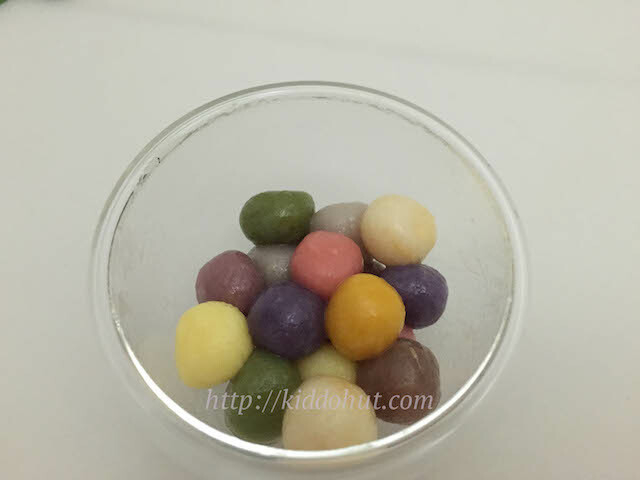 Using orange or purple sweet potato puree to make orange or purple glutinous rice balls somehow changed the chewy texture of how a glutinous rice ball should have. Some may suggest adding other types of flour like tapioca flour to give a QQ texture but you won’t get the original chewy bite of a glutinous rice ball. If you prefer such QQ yet slightly soft texture, you can attempt the Sweet Potato/Taro balls from my earlier post. Most of the following colours were made mainly from the freshly squeezed or boiled juice. I have also tried making blue by adding a tiny bit of baking soda to the blueberries juice. It did turn blue initially when I used a few drops for experimenting but I never being able to achieve blue when I used more juice. Presumably, I added the baking soda too much and too quickly, it turned into very dark blue almost black. I tried a couple of times but admittedly, I was quite caught for time and gave up making blue. Probably, using the blue pea flower is the easiest but I have yet to try that. There other food stuff that can achieve the same colours like red cabbage for purple, strawberry for pink or matcha powder for green etc. But, this round I have no time to try everything. It is interesting to experiment no doubt. Plus, using the same natural food colouring could produce different results on the type of food you are making. Take for example, I used beetroot juice on my Lapis Sagu and it turned out to be bright red. But, for the glutinous rice balls, it just turned pink due to the amount of liquid ingredient needed. (II) How about the fillings? Next, for the fillings, they are very easy recipes. For chocolate fillings, I simply used sugar-free milk chocolate (very much for health reason, you can use any type of milk chocolate), broke them into smaller pieces and roll it into small balls (the chocolate needs to be in the room temperature state and not directly from the fridge, for easy managing of the chocolate). I used the recipe from my earlier post on green bean cake which featured the savoury green bean cake, with some modifications. 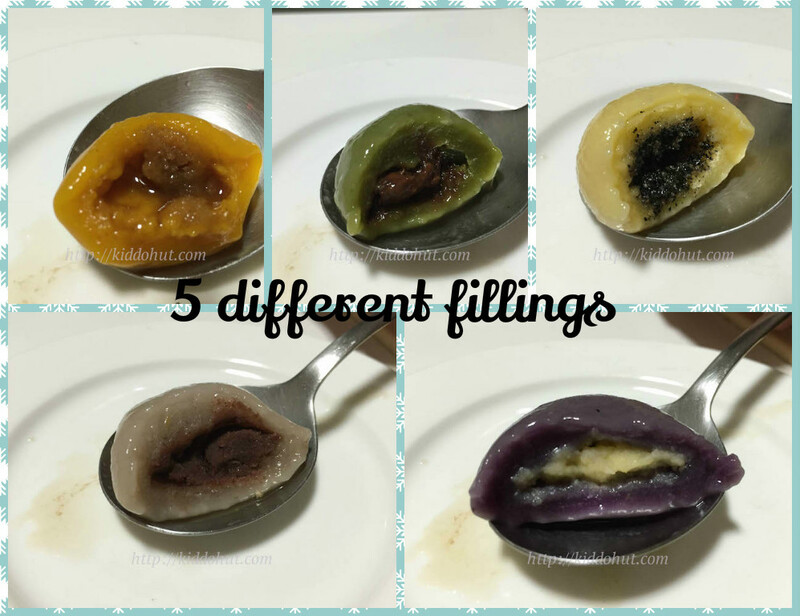 My testers told me, it is very interesting to eat fillings that is saltish than the traditionally sweet ones especially when the soup is sweet. It is a nice combination. Lastly, is the sweet ginger crunch fillings. I am pretty sure I am the first to come up with such fillings 🙂 It is a dessert I ate in New Zealand named Ginger Crunch which has a layer of hard icing on top of the slice. We love the ginger taste on the top layer the first time we tasted it during our holiday. With the help of the Edmonds’ Cookery Book, I did the fillings and stuff it inside the glutinous rice balls. “Yummy!” was the first reaction from my husband who took his bite on the Ginger Crunch Tang Yuan! For those who don’t like any fillings for your glutinous rice balls, just roll the dough into small balls, boil and eat! (III) What goes well with the glutinous rice balls? Instead of ginger soup, eat it with red bean paste soup. Maybe you don’t like soupy stuff, why not coat the glutinous rice balls with grounded peanut and just eat like that? One important tip to ensure your fillings do not leaked during boiling the glutinous rice balls is to weigh every dough ball before wrapping all the approximate equal-sized fillings. Each dough ball of mine weighed approximately 20g. Ensure you roll the fillings into round shape in all equal sized in advance. Wanna try all colours, different fillings and various soup bases for the forthcoming winter solstice (冬至)? Brown: Depends on the tone of brown. I used approximately 15g powder to 50g flour. Beetroot juice: Cut beetroot into small cubes and boil in water for 10 minutes under low heat. Drain and put juice aside. Pandan essence: Click here for the steps to make pandan juice/essence. Blueberries juice: Put all blueberries in a pot and crush them using back of the fork and boil under low heat for 2-3 minutes. If it becomes too sticky, add some water. Strain and set the juice aside. Carrot and grapes: Just juiced them. 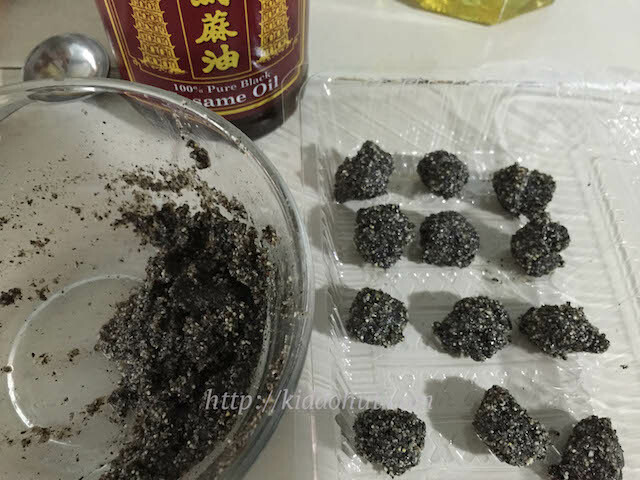 Black sesame: Mix all together until it becomes a paste and roll into small balls. Freeze. (Savoury) Green bean: Click here for the steps to make the green bean paste. Roll into small balls. Fridge. Red bean: Soak the red bean for at least 2 hours, boil in water under medium-low heat for 2 hours. Strain and blend the cooked red bean. Stir fry the blended red bean with a bit of oil until the paste is drier. 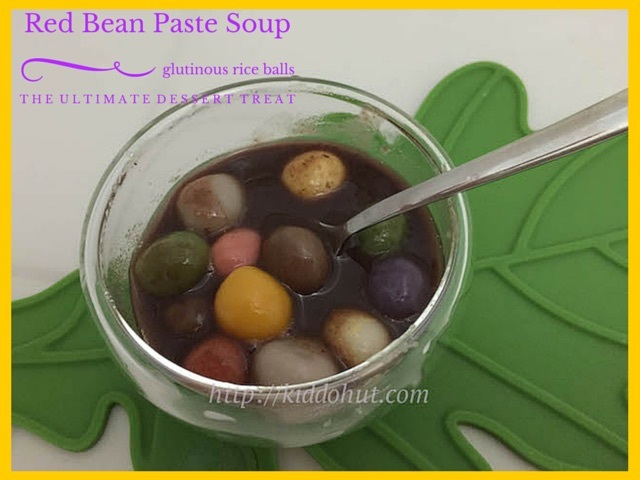 The red bean soup can be drank or keep to make red bean paste soup as soup base for the glutinous rice balls. Ginger crunch: Melt the butter in the pan, add all ingredients and mix well. Off heat when all ingredients are well mix. When it is not scotching hot for hands to touch, roll them into small balls before freezing. The mixture will be harden when cool. Boil the sliced ginger in water for 15 minutes, covered under low heat. Then add sugar to taste. Add the juice / liquid into the glutinous rice flour bit by bit. Knead the dough after adding the water each time until you achieve a firm and manageable dough. Then add oil when a dough is formed. 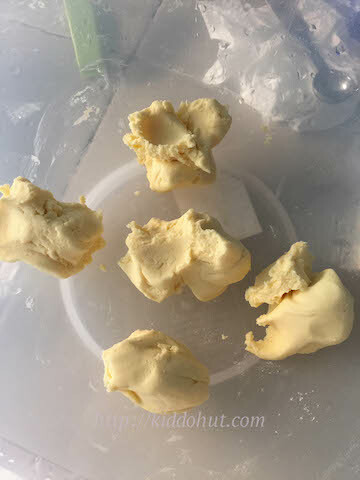 If the dough is too dry, add a bit of water. If it is too wet, add more flour. The texture should be moist and doesn’t stick to fingers yet not too wet. If it is too wet or moist, it will be difficult to wrap the filling. If it is too dry, it will crack during and after wrapping the fillings. This is similar to making Ondeh-Ondeh from my earlier post. Divide the dough into small portions approximately +/- 20g per piece. You can reduce the size if prefer a smaller glutinous rice ball. Roll each portion slightly then make a little dent to the centre of each portion of dough using your thumb, be careful not to push too deep and thin the wrap too much. Place the fillings in the centre. Then, wrap the filling and roll the ball slightly to ensure the ball is smooth. If there is crack, just dust a bit of glutinous rice flour to smooth the crack. You can dust a bit of glutinous rice flour on your palm and fingers to prevent the dough from sticking. Bring the pot of water to boil. The water level should be enough for the dough balls to maneuver in the pot and able to float. When boiling, lower the heat to very gentle simmer. 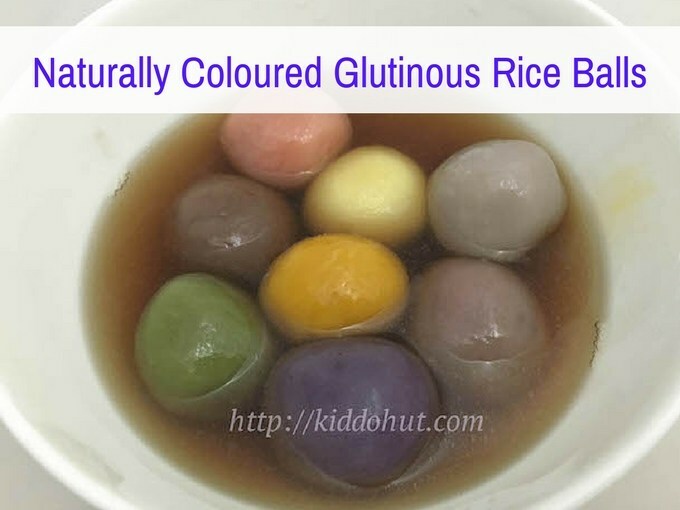 Put the glutinous rice balls gently into the water and stir very gently to swirl the water around the dough balls to prevent them from sticking to one another and to the bottom of the pot. The water must be barely simmering for gentle cooking of the dough balls to prevent them from bursting. When the cooked glutinous rice balls float up, use the perforated spoon to drain them. Add the ginger soup to the bowl of rice balls. Serve. Thanks so much for your kindness in sharing your recipe. You have great ideas in using natural colours.Thanks for your caring attitude. Hi Sia Kim, thank you for visiting Kiddo Hut and I hope you have fun making delicious food from the recipes.